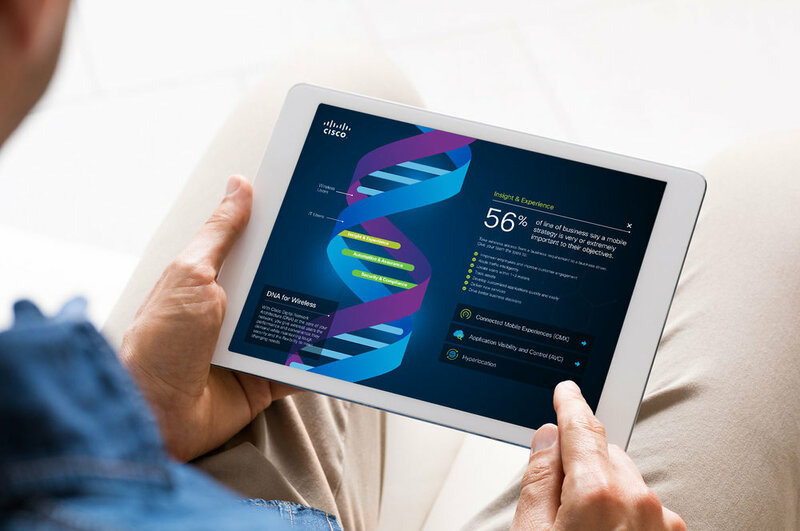 When Cisco launched their new Digital Networking Architecture (DNA) software-defined network (SD-WAN) solution, we created an immersive environment that would be both an informative and interactive experience for the user. By working closely with the marketing team at Cisco, we were able to create an interactive double-helix infographic that was on-brand, but explored new territory with VR. Adding interactivity allowed users to immerse themselves inside the double helix to explore what Cisco DNA does for networks and users. One of the most important factors of this project was to create a design that was fully optimized for all devices and screens. This allowed users to access the infographic anywhere, anytime. To complete the experience, custom icons were created to help represent Cisco DNA’s features.